"Everything that you are is enough." 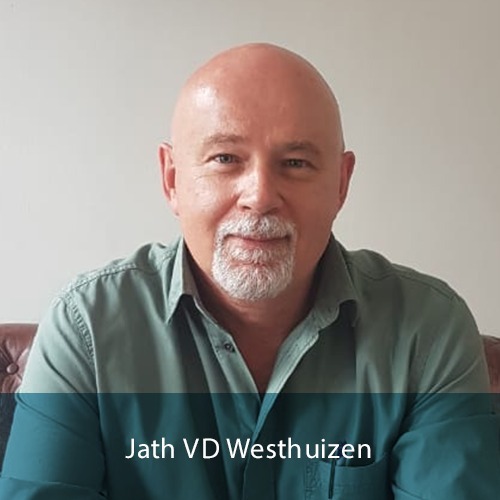 Jath Van Der Westhuizen is the social worker and spiritual counsellor of Zwavelstream Clinic. Being a social worker since 1991, he specialises in the following areas: small group life-skills facilitation, addiction counselling, lifestyle coaching and company wellness programs. As a spiritual counsellor, Jath assists people with their spiritual needs such as forgiveness, reconciliation and spiritual growth. Jath's mission is to empower people with the necessary life skills to manage challenges and to help develop their potential. Jath uses several methods to assist with facilitation training and life skills development. These methods assist in educating people about managing conflict, stress, competencies, change and people. Jath shares valuable lessons that involve problem solving & critical thinking skills.